This page concerns itself with doublestroke rolls, their applications, and the fulcrum control necessary to consistently achieve good rolls. Full ‘o Crumb challenges your control of fulcrum pressure and finger assistance by juxtaposing singlestrokes, doublestrokes, and flam-taps. It will require a lot of dexterity to switch between the demands of the different rudiments. Pinch Perfect requires the consistent application of a given amount of fulcrum pressure and finger assistance to create strong and consistently-timed doublestrokes. Variations then alter the release of the roll so that the fulcrum pressure and finger assistance demands are not uniform throughout 100% of the exercise. Durrty Dubbles works on double beats using variations that allow for one hand to check the timing and sound quality of the other hand. You must variously create doublestop doublestrokes, doublestrokes where the first note of one hand coincides with the second note of the other, and singlestroke fours. The unison doublestrokes facilitate building a completely uniform doublestroke motion between the two hands. The half-unison doublestrokes force you to match sound quality and timing when the doublestop note is achieved through differing amounts of forearm assistance, wrist turn, and fulcrum pressure between the two hands. The single-stroke fours give you an opportunity to hear each note of both hands’ doublestrokes by itself, without being hidden within a doublestop. Nice Kicks is a diddle interp exercise that is primarily focused on rolls that put an accent before their release. Rehearsing different roll interpretations is an excellent practice for building confidence and consistency in timing, as well as greater fulcrum control. Apart form this benefit, the figures in this exercse are interesting rudimental fare in their own right—fun to include in musical passages to create a looser rhythmic feel where appropriate. 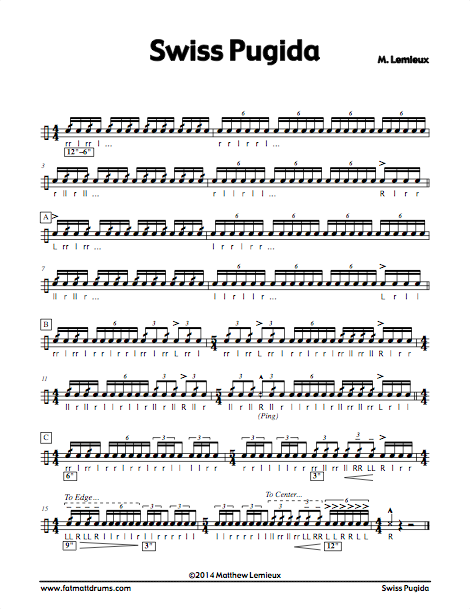 Beedlabop was written for the 2015 Weber State Indoor Percussion snare line to work on cold roll attacks, four-stroke rolls, fulcrum pressure consistency, and second-note timing. One objective is to maintain proper velocity and rebound through the four-stroke rolls; even though there is a lot of space between doublestroke attacks, the second note of each doublestroke should still rebound, both for the sake of endurance and for ensuring a big, open sound on both notes of the doublestroke. The split part in measure 5 is a fun way to check timing and sound quality in a group or line setting. It is like the common trick of having half the line play a triplet roll while half the line plays eighth notes; however, in this context, everyone is responsible for multiple isolated attacks to create the overarching barrage of 24th notes. 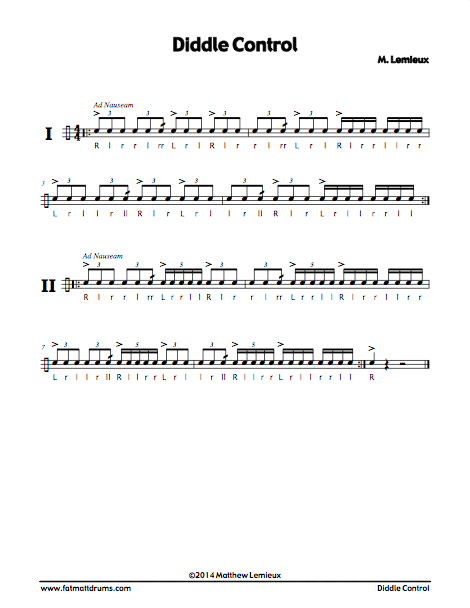 Tap-Couple-of-Diddles takes the tap-five rudiment and pushes the doublestrokes around the beat in different ways. Doublestroke spacing remains the same throughout, while the initiations of the diddles are varied. Beef Shawarma works on triplet rolls at different dynamics and with different playing zones. Maintaining roll quality across the range of heights and around the drum head is crucial to playing snare drum in an indoor drumline, where discrepancies in sound quality at different heights, as well as discrepancies in precise bead placement, can dramatically impact the quality of the music. A useful variation would be to replace the "edge" position with the "guts" position (2 o'clock on the drum head, over the snare bed) and perform the exercise that way. Matching sound quality between hands is a little more challenging at the "guts" position and while transitioning to it, since the left bead has to move slightly in front of the right in order to match distance from the rim. If you really want to push your versatility, another variation is to reverse the dynamics (i.e., piano becomes forte, crescendo becomes decrescendo, etc. ), so you end up doing weird things like crescendoing towards the edge, which creates an interesting sonic effect, in addition to forcing you to match roll quality at the high dynamic with very little snare response to support the sound and hide discrepancies in timing. Sick-Stroke Roll Schops is a chops builder or just a good way to get pretty warm pretty quick. It has really basic construction (other than the 5-bar tag) so you can just dive right in. If this website had a theme, it would be juxtaposing different interpretations of rudiments. The rationale behind this practice is usually given as "building understanding and control of the space between notes", but in the context of this exercise, it's also just a good way to warm up the muscles you'll need. It's common to play a bunch of kinda fast rolls to get the blood flowing... now you can play a bunch of fast rolls with some slightly slower double-beats thrown in there, as well as accents and taps... and you have to switch between them... a lot. Invert Roll and Fortepianos are two exercises that I used with the 2014 WSIP snare line in order to work on doublestrokes, with a silly fill to mash the two together. I like using inverted rolls to work on doublestrokes because it puts the second note of each diddle on the eighth notes, where weaknesses will be more obvious to the ear. The focus of both exercises should be matching comfort and sound quality between the forte diddles and the diddles at the tap height. 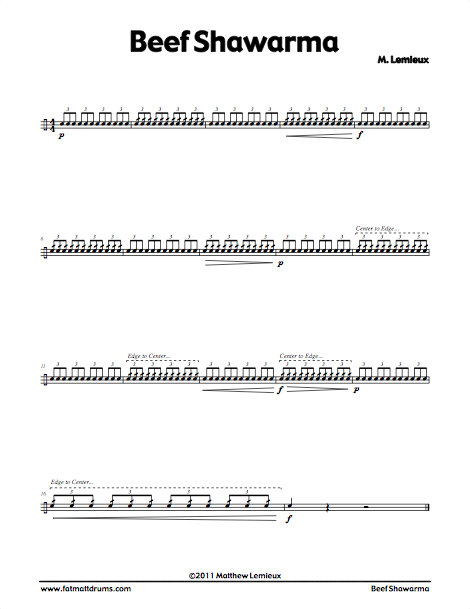 Swiss Pugida is an exercise I used with the 2014 WSIP snare line to work on diddle interpretation: if the slurred and "straight" interpretations can be understood as separate rudiments, then the correct interpretation can be called upon in the right context. Diddle Control is a short, seemingly-simple pattern that juxtaposes several different diddle speeds and requires the lead hand to rapidly switch between them. Not Chicken and a Roll is a twist on the classic Higga-digga-burr, also called Chicken and a Roll in some circles (like... "check into a roll"... Does joke get you?). The basis of those exercises is to build larger motions with a check pattern and then add the smaller motions with the diddles. 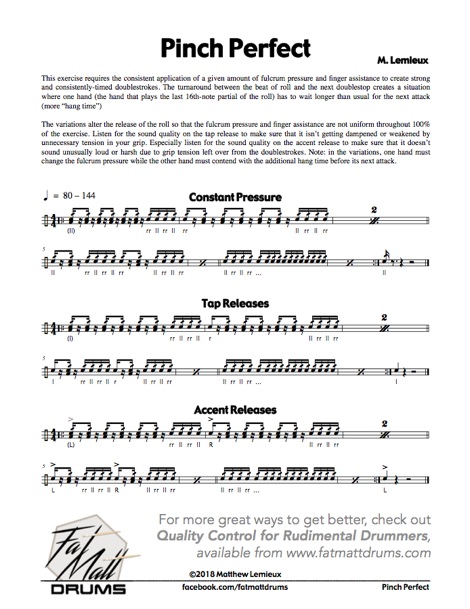 This exercise throws that idea out the window, instead relating eighth-note timing to 4:3-tuplet rolls. It's trippy... but I like trippy. This Open Roll Builder is a triplet-roll analogue to the stock "Diddle Tap" exercise; this one works on the eighth-note-based breakdowns of an open triplet roll, instead of a duple roll. Shifting Gears works the metric transition between 16th-note and triplet diddle figures. The tendency will be to either be fast or tight going into the triplet figures, and to be slow or wide going into the 16th-note figures. Such metric transitions are worth practising, not because they appear often, but because they demand a mastery of fulcrum pressure, wrist control, and diddle placement that will make more common diddle contexts (e.g. cold attacks, tap-rolls) more easy to reliably execute.